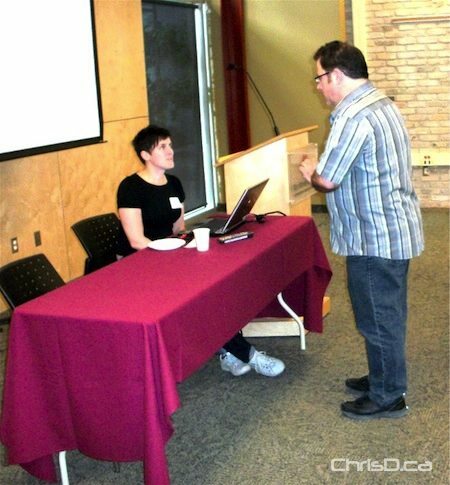 Home » News » Our Winnipeg Public Consultations — One Big Flop? Our Winnipeg Public Consultations — One Big Flop? The City of Winnipeg unveiled its draft plan for the next 25 years under the Our Winnipeg project on Wednesday. Over 40,000 citizens contributed their input to the civic planning draft and gave feedback on how land development should move forward in the years to come. The document released earlier this week contains over 100 pages of ideas the city is looking to explore. On Wednesday, the first public consultation after the report was made public was held at Red River College’s downtown campus. Marty Gold (right) at 92.9 KICK-FM pointed out that not a single person showed up — which is evident in the photos above. Gold goes on to question why the public consultation sessions were scheduled with less than 24 hours notice and during the middle of a weekday. According to his post, the operators at 311 didn’t have any information on the times and locations to these sessions. An e-mail we sent to 311 referred us to the Our Winnipeg website for details. A handful of further public information sessions are scheduled for next week, including one this Saturday at Win Gardiner Place at 1 p.m. Hopefully some people show up this time.